I just wrapped up a week of Picademy in Atlanta. 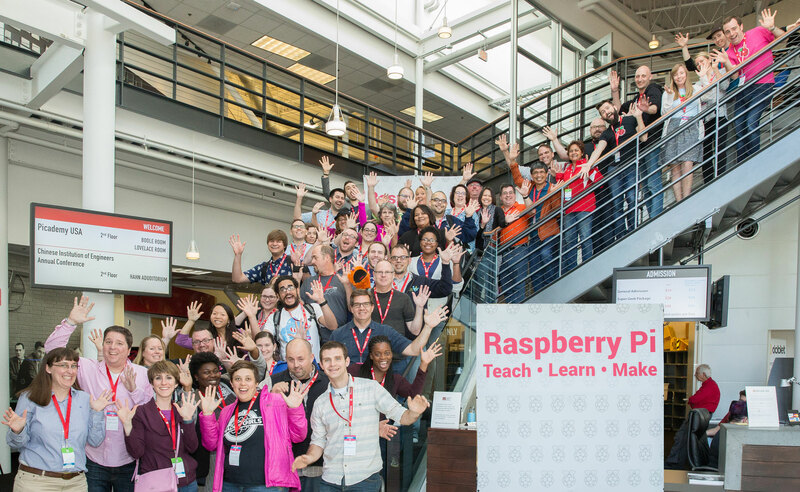 Picademy is a two day professional development event hosted by the Raspberry Pi Foundation. It's a "free face-to-face professional development programme that supports educators throughout their digital making and computing journey". After completing the two days of awesome PD, each member becomes a Raspberry Pi Certified Educator (RCE). I was lucky to be part of the first North American cohort a few years ago. It would be easy for me to talk about it being the best PD I have every received. I'm not sure I would have written my Makerspace books if I had not attended Picademy and had the support of the community as I explored digital and physical making. Here is a GIF that still makes its rounds within the Pi Foundation that shows how much I really loved the event. I wanted to write about the community of Raspberry Pi and how it impacts teachers around the globe. Some people do not know this, but The Raspberry Pi Foundation is a non-profit. They make these awesome computers and strive to make sure that every student has access to Computer Science. That is an amazing goal, but it is the people that truly make it so phenomenal. For the past few years, the Raspberry Pi team in North America has grown from 2 people to 5 people. All of the events that have taken place are because of these amazing and hard working people. I have been lucky to work with them in different ways to support their mission. With the support of the amazing UK team, the North American team has done a tremendous job of creating a community of educators that, not only learn so much, but actively work to share what they have learned with other teachers and students. Teachers from across the country connect to support learning for themselves and also their students. That is such an amazing thing to create and the entire Raspberry Pi Foundation should be proud of this. As I said earlier, I just finished the Picademy in Atlanta and I have helped with other events in the past as well. I took some time to reflect on why I commit the time and energy to do a week long PD event. The answer came to me and it was quite simple, I love being part of the community that Raspberry Pi is building and helping grow that community as a facilitator is a great experience. Every time I help with an event and work with teachers and/or students with Raspberry Pi, I get to learn more myself. The selfish part of the entire thing is that I get to continue to grow and learn as a physical and digital maker. It is something that is so important for my Maker Mentality. I always want to try and learn new things and teaching teachers is a great way to explore. The community that is continuing to grow around Picademy and the Raspberry Pi Jams, is something that I am very lucky to be part of in my educational travels. Educators talk about finding their tribe and I believe you can have different tribes that support you in different ways. NErDcampMI is a tribe that nurtures my literary side and the Picademy tribe nurtures my Maker Mentality side. I want to say thank you to Philip, Matt, Courtney, Ben, Dana, Andrew, Christina, Carrie Anne, Russell, and everyone else that has allowed me to be part of the Pi team in one way or another. You kindness and generosity has allowed an amazing community to grow and I'm thankful to be part of it. If you want to know more about Picademyraspberrypi.org, check out the link. If you want to know more about Raspberry Pi in general, check out their redesigned site.